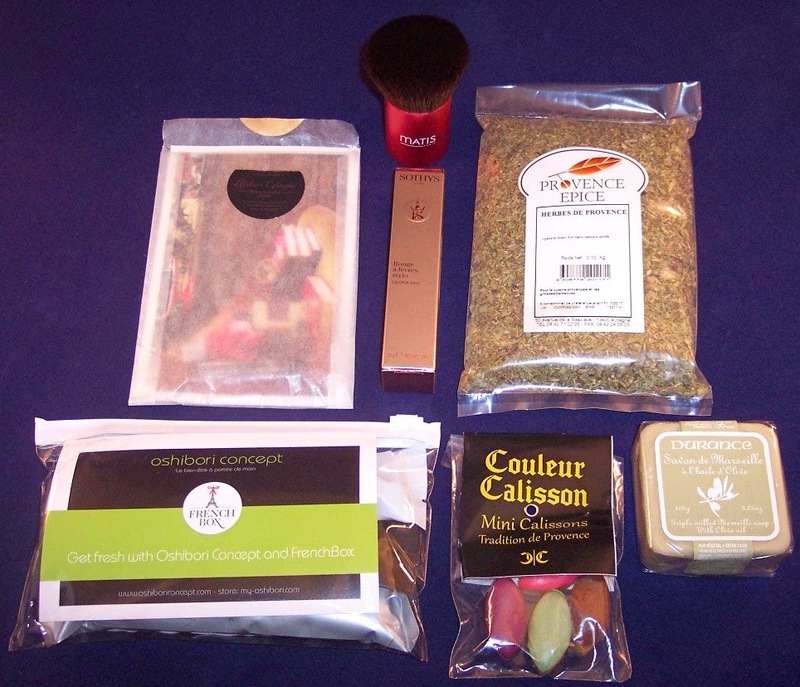 French Box Review, October 2014 + $10 Discount Code!! If there were a prize for the most elegant subscription box, French Box would be the hands down winner. I believe the October box was the third for this new company. In terms of curation and product quality in a non-beauty box, I don't think there is another subscription out there that compares. 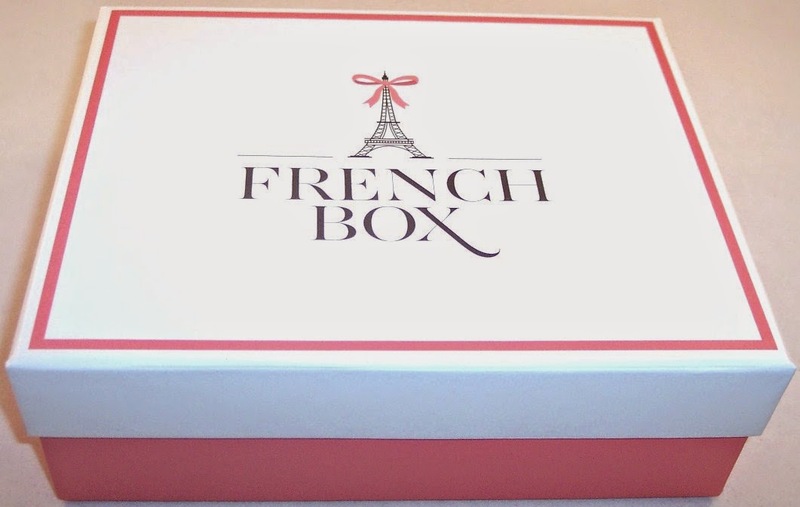 French Box truly raises the bar for what a subscription box can be! You know you're in for a special experience when you see this box. It is NOT your average cardboard box, rather, it is heavyweight and suitable for permanent storage or gift giving. October's box contains an eclectic mix of French brands, ranging from gourmet herbs to cologne to towelettes, soap, cosmetics and sweets. The paper in this box includes a big postcard with a saying from Provence on the front. Another card tells about Sothy's makeup which is frequently featured in French Boxes. A third card gives three dip recipes to make use of the big packet of herbs in this box. 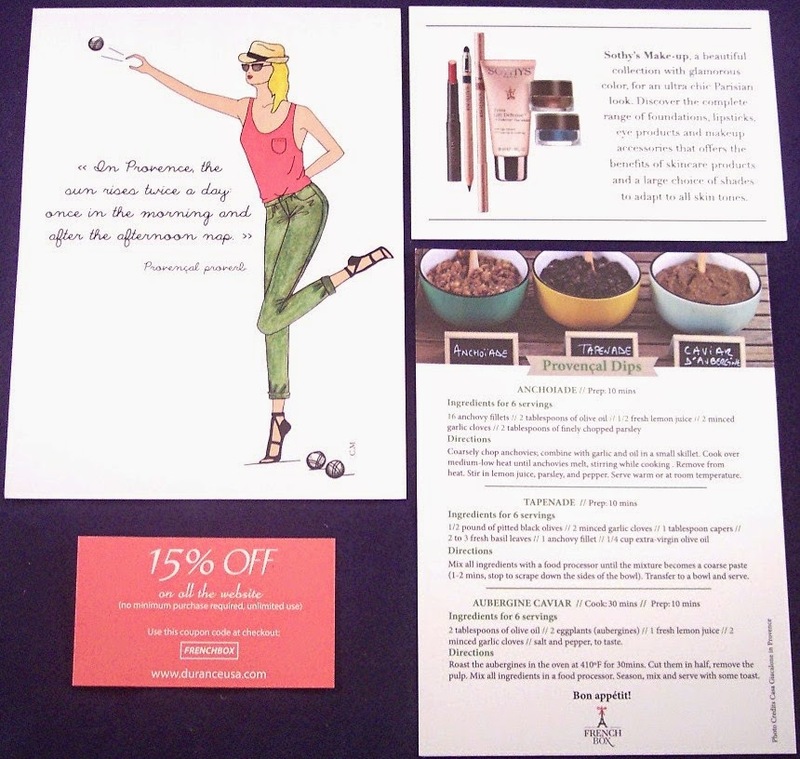 The pink card gives a 15% discount code that can be used for anything on the Durance website, which offers an intriguing collection of imported products from Aromas of France, LLC. If you might be interested, use code FRENCHBOX at checkout. There is no minimum purchase and the code is good for unlimited use. 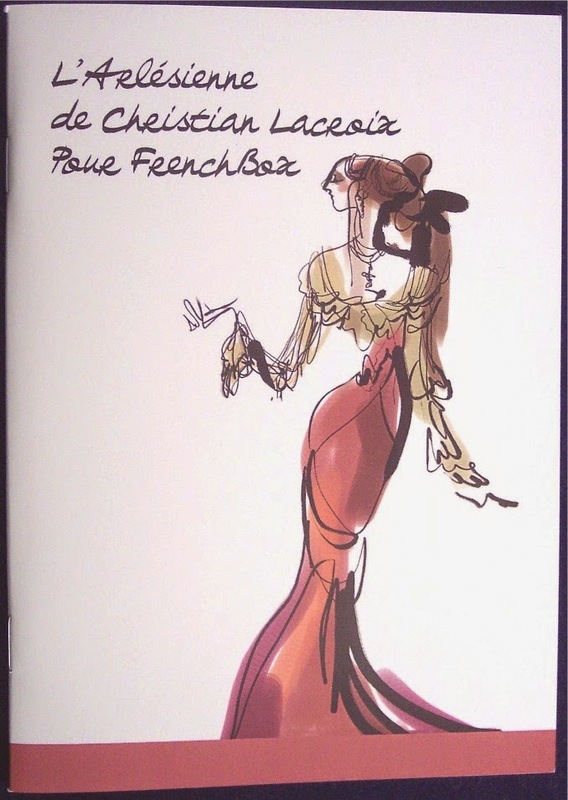 They included an elegant little notebook with a stylish lady from Christian Lacroix on the front. This book is full of blank pages and is the perfect size to carry in a purse. There is a big 4 oz. 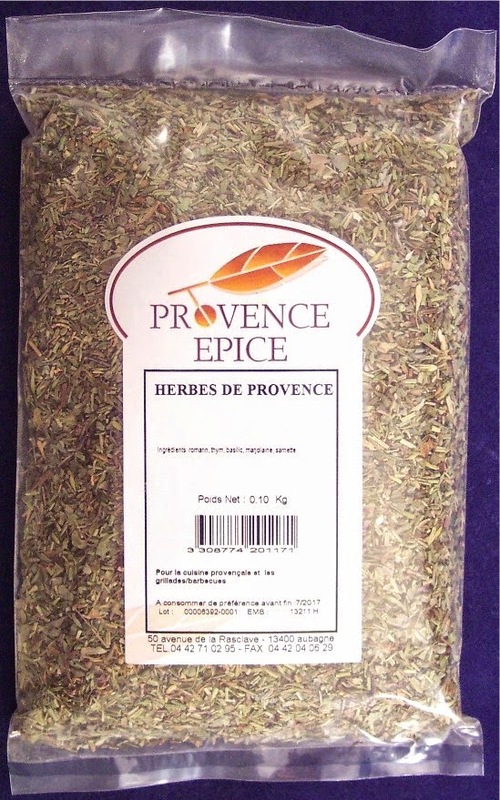 package of "Herbes de Provence" from Provence Epice. This mix contains basil, savory, rosemary, thyme and marjoram. I have all sorts of plans for this including meat rubs and vegetable seasonings. 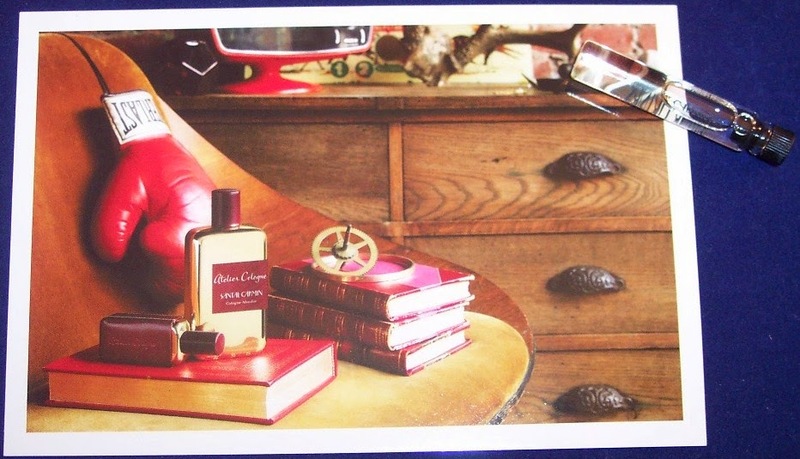 A glassine envelope contains an Atelier Cologne postcard and a sample of their "Santal Carmin" fragrance. This has an intoxicating spicy woodsy scent. I normally don't get too excited about fragrance samples but this one is exquisite. Since its retail price starts at $195, I will make this sample last! I'm going to put a couple of drops on the postcard, then hide it away in my lingerie drawer. 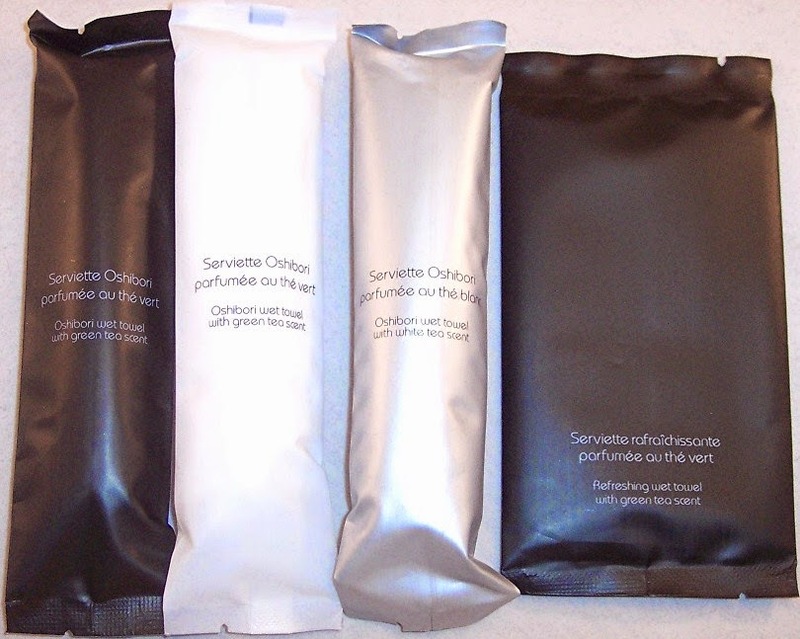 A little zip top bag contains four 100% cotton towelettes from Oshibori. These are infused with a green tea scent. I'm guessing these are similar to the ones you get on airplanes after long flights, just better smelling. They are all wrapped individually, so I'll pop one into my purse. So very French! 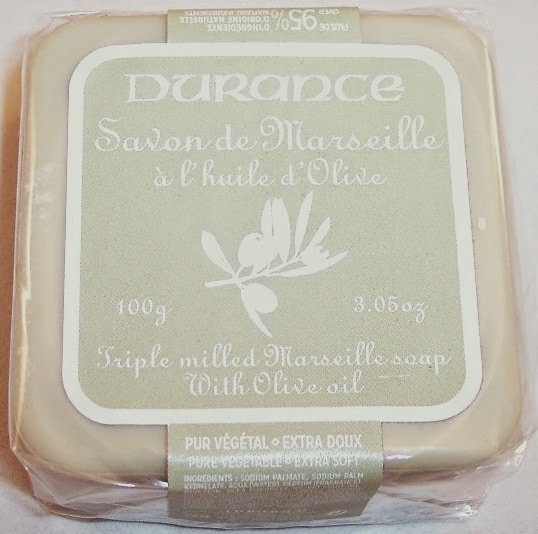 Next is a lovely triple milled Marseille soap also from Durance. This has SUCH an elegant scent; I just may use the code up above to get more of this from their website. This soap is actually a light olive green, not as washed out as it looks in this photo. Tres, tres chic! 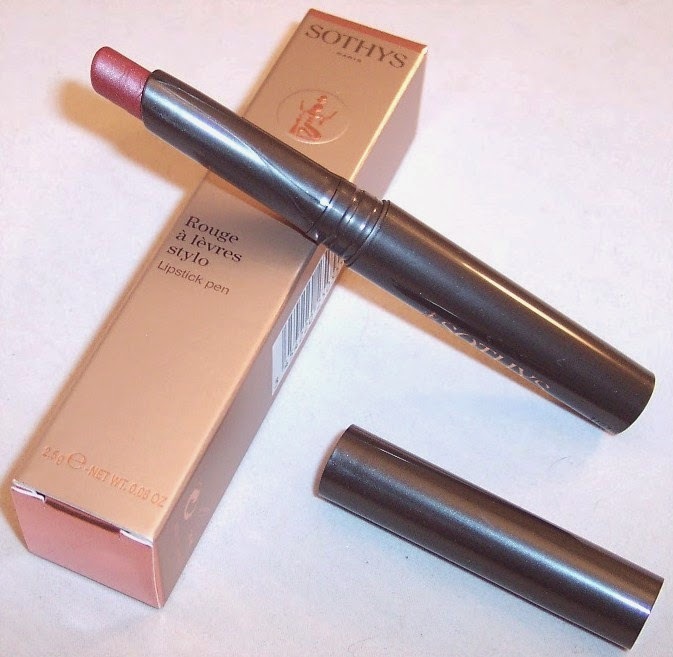 This beautifully boxed Sothy's lipstick pen is not listed on the information card. So I don't know if it was tossed into the box by mistake or if it's just a bonus. But French Box has taught me to appreciate anything I get from Sothys, so I'm very pleased to try this. This one is in a dark rosy red shade, called "Rose". 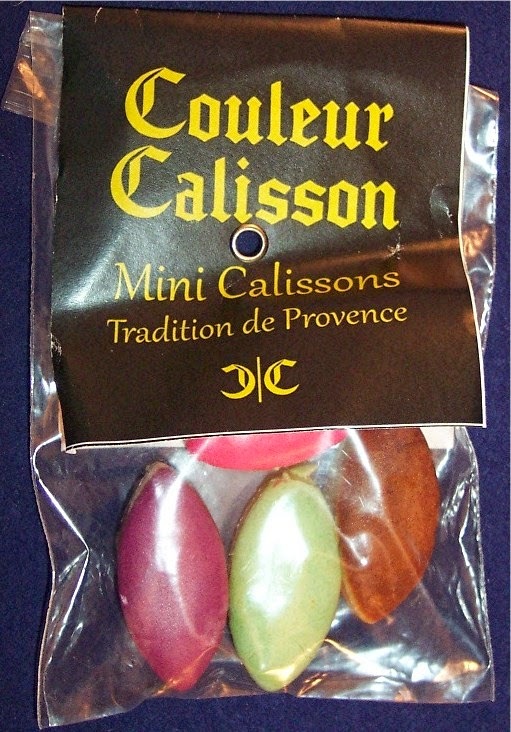 The last item is a little package of four calissons from Couleur Calisson. These are traditional candies from Provence which are made of a fruit paste ground with almonds (basically marzipan) and topped with a pastel colored royal icing. Although I've traveled in France, I was completely unfamiliar with these. They have a very delicate barely-there fruity almond taste. As you can see, the contents of this box beautifully represent certain areas of France...Provence in particular. The items have obviously been chosen with the utmost care and with the intention of delighting all the senses in an understated and elegant way. That's something I need more of in my life; how about you? If you'd like to try French Box, use code NMTKGK9OO1 to get $10 off your order. You can get discounts with longer term orders. As this is quickly becoming one of my top three favorite subscription boxes, I plan to upgrade my own subscription soon! Give yourself a little sensory vacation and try French Box. I'm certain you won't be disappointed! Fortune Cookie Soap Company Halloween Haul 2014 + $5 Store Discount! The five adjectives that best describe my current Fortune Cookie Soap Company haul are: decadent, colorful, weird, sparkly and scentalicious! Since I've been subscribing to their quarterly boxes for quite a while now, I decided to take advantage of a recent discount offer and dive into their two Halloween themed collections; "Witch, Please!" and "Third Times the Charm" plus a couple of their older collections for some full sized products. If you're one of those who can't handle scents, you may want to skip this post....because it's ALL about scent. In fact, when I went to my p.o. box to pick up my mail the other day, I could SMELL this box before I even found the locker it was in! Later, the post office counter person asked me what in the world I had ordered that smelled so good. 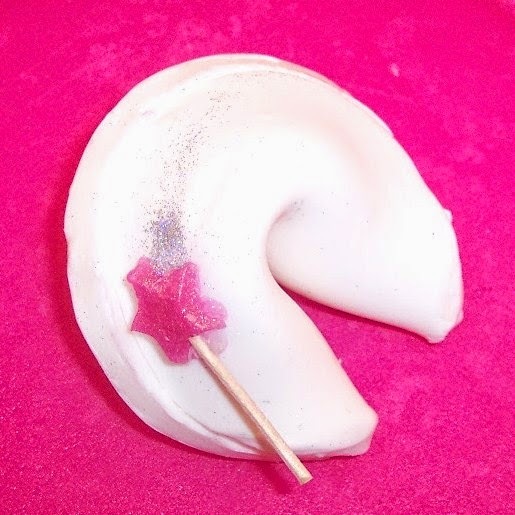 Those who are familiar with the Fortune Cookie Soap Company won't be surprised by the goofball silliness and irreverence that goes into many of their product names...that's part of the charm. But don't be fooled; these are truly luxurious bath and body products! 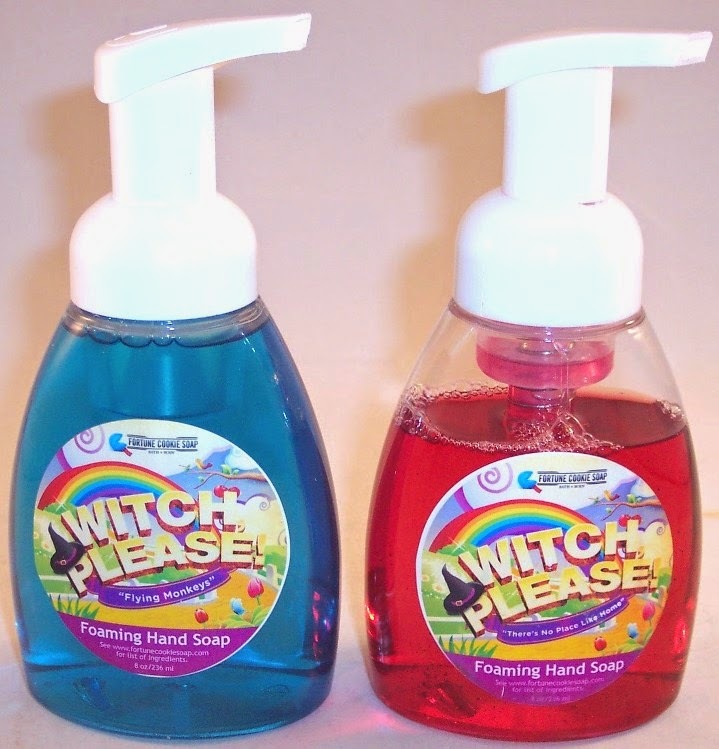 This group contained two foaming hand soaps from the "Witch, Please!" collection. As you can see, one of them is already in use. The two I got are "Flying Monkeys" and "There's No Place Like Home". "Flying Monkeys" is a fruity scent that combines banana, peach, watermelon, neroli and jasmine with air and aquatic notes. Hard to describe, but really light and lovely and also mostly sold out! "There's No Place Like Home" is a spicy apple cinnamon scent...perfect for the season. This "Candy Aisle" microdermabrasion facial scrub was chosen based on a sample in their summer box. This is in the scent "Lemon Drop It Like It's Hot", which has a very light lemony smell. I like this product but am disappointed in the small size (about 3 oz.) for the price paid ($14.99). Back to Halloween and the "Witch, Please!" 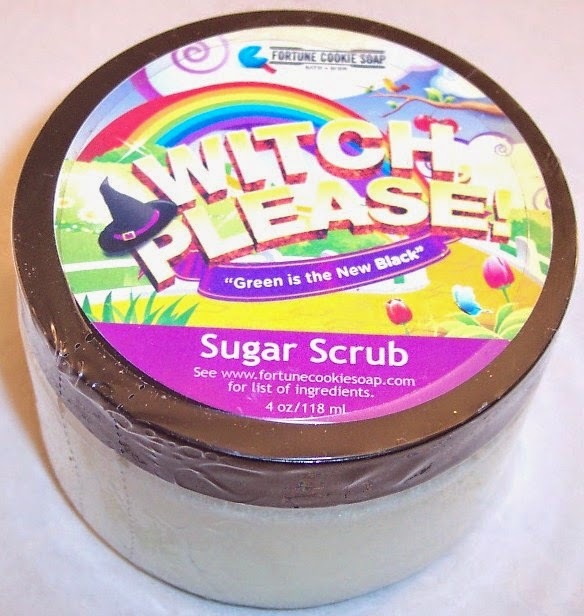 line....there is a Sugar Scrub in the "Green is the New Black" scent. This scrub actually is a very pale green with a complex scent that includes fruity top notes, fall flavors (pumpkin, cinnamon and nutmeg) and warm vanilla. One might be forgiven for wanting a little taste! I can never resist a couple of their signature soaps....fortune cookie shapes complete with paper fortunes. This time I got "The Candy Addict", a solid neon pink soap and "Miss Popular", a white soap with a little flirt of a sparkly pink star wand attached! The top one smells like candy and the second one has an unusual scent that smells like honey and multiple floral scents combined. 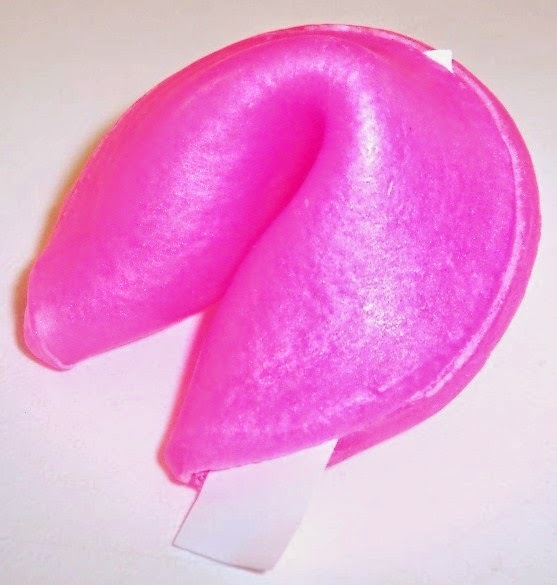 A word of caution regarding the fortune cookie shaped soaps. They make terrific gifts and they look great on the counter or in a soap dish. But their value as bath or shower soaps is dubious since they lose their shape and degrade very quickly. It's fun to try these but don't mistake them for a full size bar of soap. 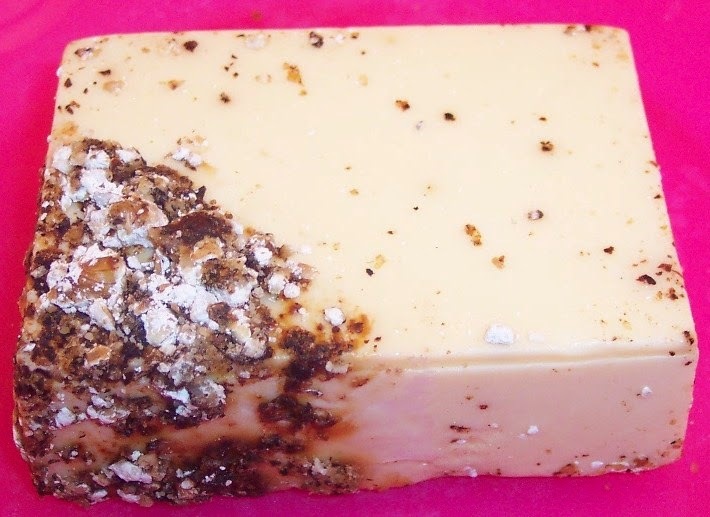 Having said that, FCS has some wonderful full size bar soaps like this "Creamy Dreamy Oatmeal Cookie" soap which smells just like an oatmeal cookie and looks good enough to eat! 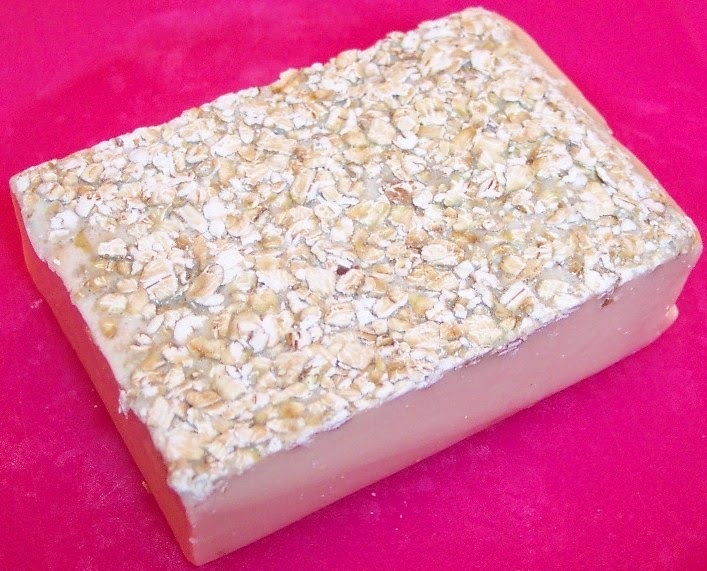 This is a goat milk soap that is good for exfoliating. 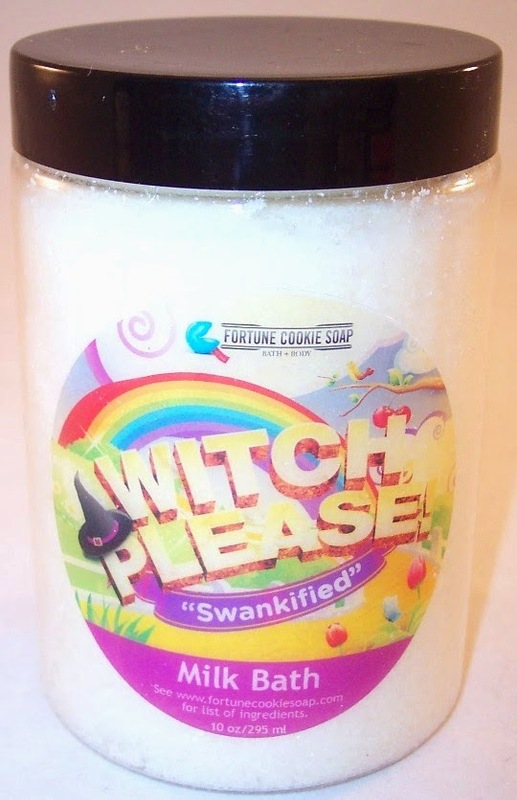 Speaking of things you might be tempted to eat....the "Swankified" bar soap from the "Witch, Please!" collection is another one that's hard to resist. It smells like bananas baked into cake batter and mixed with walnuts. Yummy! I also got this same scent in the form of a Milk Bath. Unfortunately, there doesn't look like enough product here to last for more than a few baths. At $12.99, that is disappointing. 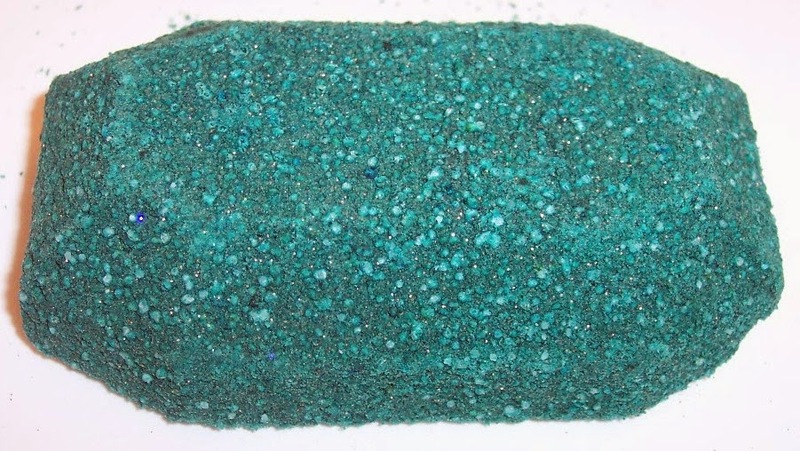 Next is a "Green Is the New Black" bath fizzy. This is REALLY green and REALLY sparkly! I'm anticipating a couple of very festive and very GREEN baths! Now for full-on Halloween....we have a "Here Lies...." bath bomb. The site description says "weed-strewn grave, wet rotting apples, swirled with thick ropes of caramel and a dusting of brown sugar". 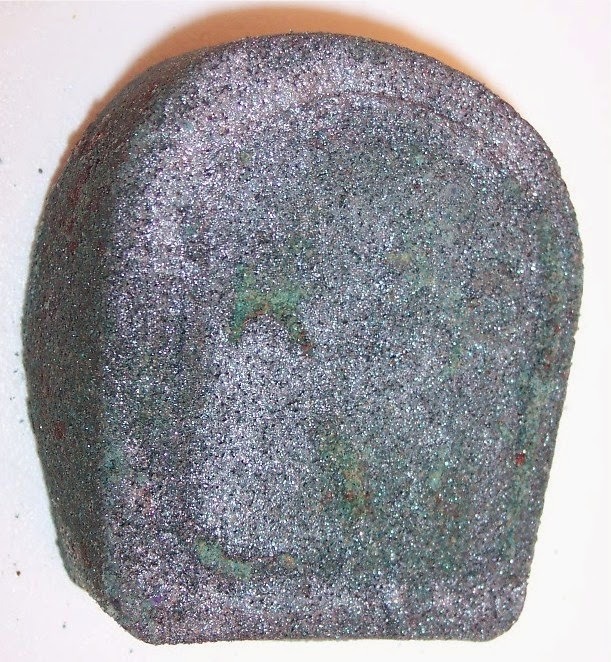 The picture on the site shows a dark purple tombstone with a cross on it. Mine is closer to black and the design isn't really discernible at all. It does smell very apple-y. I wanted to try one of FCS's hair products so got their leave-in conditioner in the "Miss Popular" scent described above. Again, pretty pricey at $9.99 for just 4 ozs. But it does smell good! 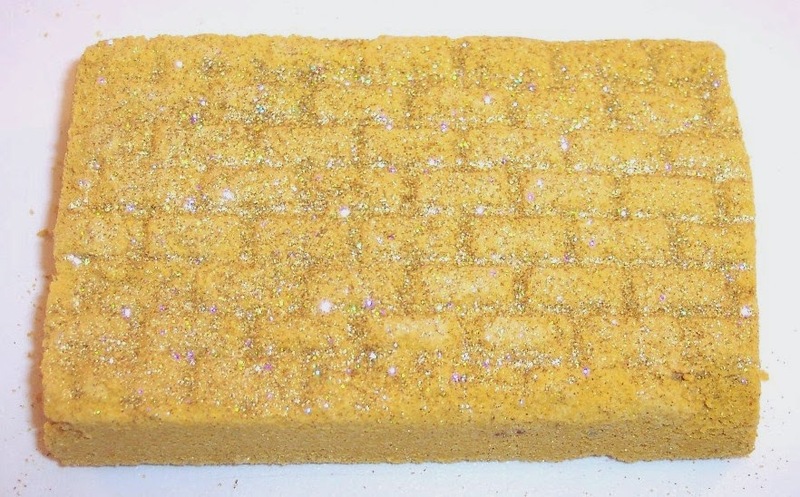 I never thought I would see the Yellow Brick Road in bath bomb form but that's exactly what the "Hair Flip" bath fizzy looks like! It's very gold and sparkly and smells like hazelnut and vanilla cream. The last product is probably one of their most well known...."Unicorn Farts" solid bubble bath. 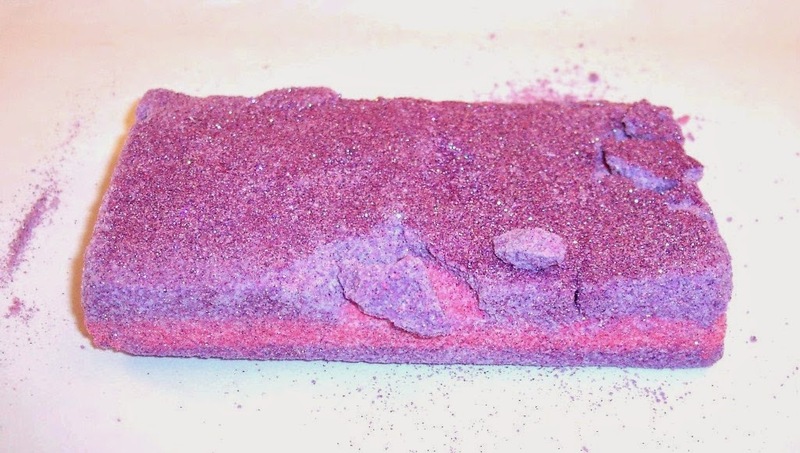 I didn't know what to expect with this one but it's a VERY girly and glittery pink and purple striped bar. The smell is hard to describe but it's sweet and a little floral. Somehow, it is my favorite scent in this whole box and that is saying a lot! That's everything from this haul. I'm looking forward to trying out these products Just having them stored around my tub and shower is going to give my bathroom a sweet olfactory makeover! If you're interested in trying the Fortune Cookie Soap Company, click on this link to get $5.00 off a purchase of $30 or more. This would be a great site to shop for someone you want to pamper over the holidays! If you become a repeat customer, they have a loyalty program where you can accumulate points for various rewards like dollars off or free shipping. With all this bath and shower loot in hand, bet you can guess where I'm headed right now! P.S. FCS's quarterly holiday soap box will start shipping on November 3rd. These are sure to sell out so grab yours and stay tuned for that review! 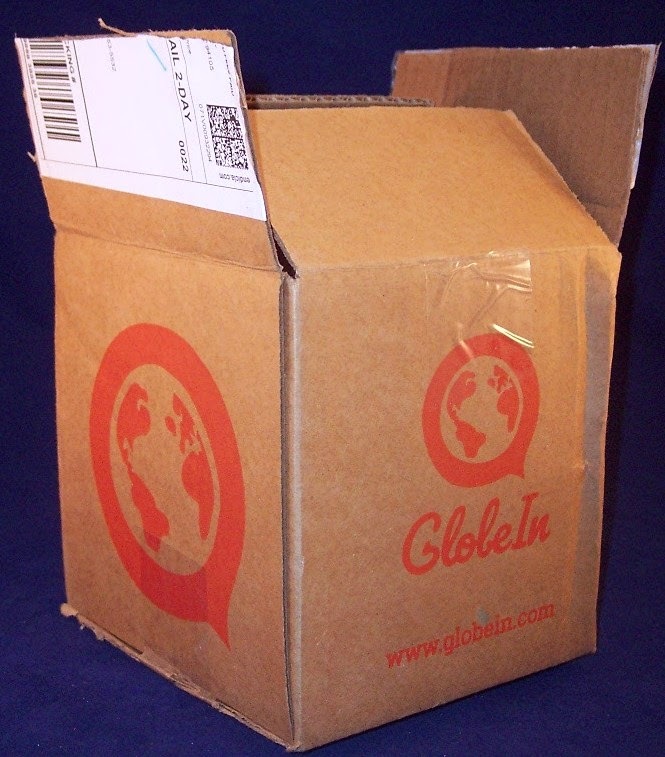 GlobeIn Artisan Crafts Subscription Box Review, October 2014, First Box Just $5.00! 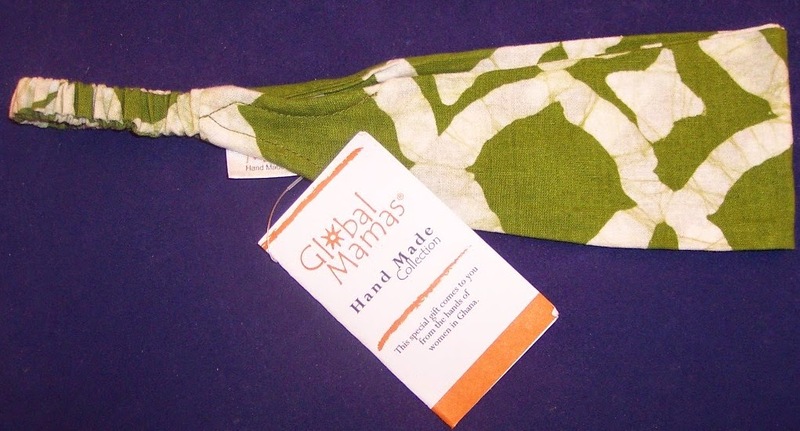 You might be familiar with the GlobeIn website where products from imperiled indigenous craftspeople in the most remote parts of the world are featured. These products reflect their cultures, traditions and lifestyles. GlobeIn has recently added a monthly subscription box that sends unique handmade items from various artisans and cultures each month. Along with the products, they send cards telling about the individual craftspeople who made the items in the box. You can also indicate if the items will be for her, for him or unisex. There is also a place to provide them with notes or suggestions which might help them to customize your box. For my first box, I chose "Awesome and Unexpected". My order arrived eight days after I placed it via USPS Priority Mail. The products were packaged in an orange branded cardboard box. The site says you will receive up to three handcrafted items but I actually received four. My box contained two batik products and two shea butter products. 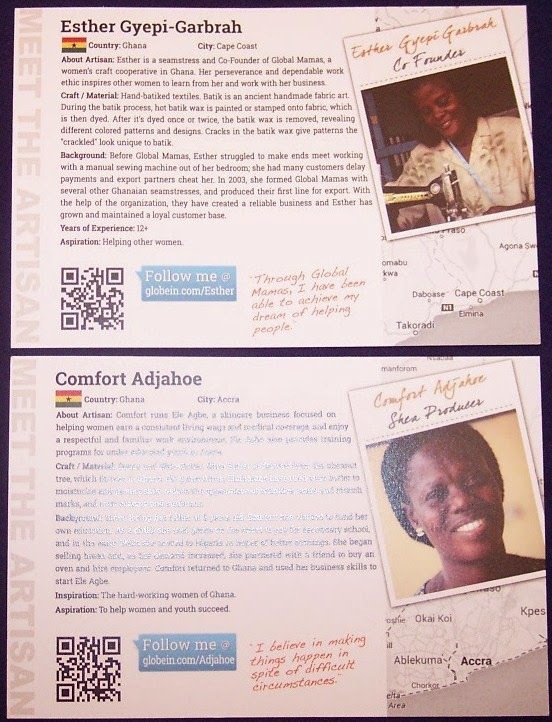 They also sent two cards with information about the craftswomen who made my items. Both women are from Ghana. It was really interesting to read about their business, the materials they use and especially their personal histories. 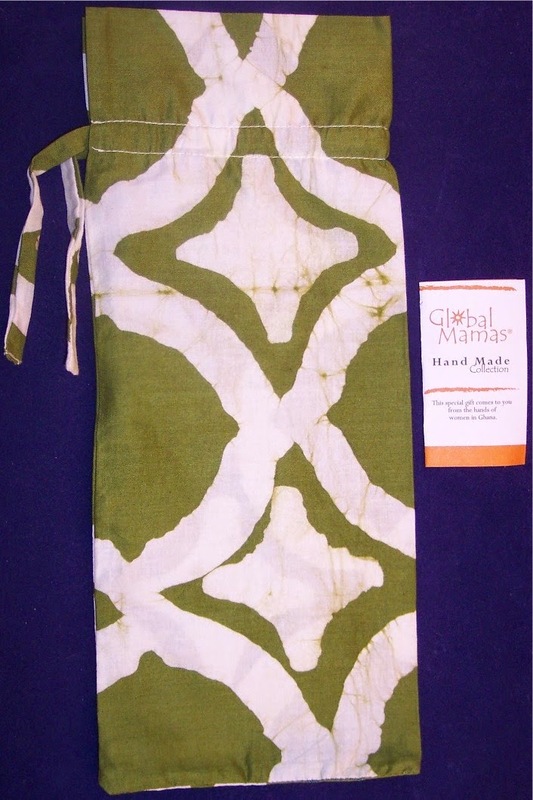 The first item is a hand batiked wine bag. Batik is an ancient fabric art form where hot wax is painted or stamped onto fabric which is then dyed. When the wax is removed, different colors or patterns are revealed. This cotton bag has a drawstring top. The attached card is hand signed by Fausty and Deborah, who made this bag. The second batik item is a matching headband with an elastic back. The attached card tells me this was made by Grace and Roseline. I really like this headband but since I have a giant head, it's a bit too small. So I will gift this to someone with a normal head size! 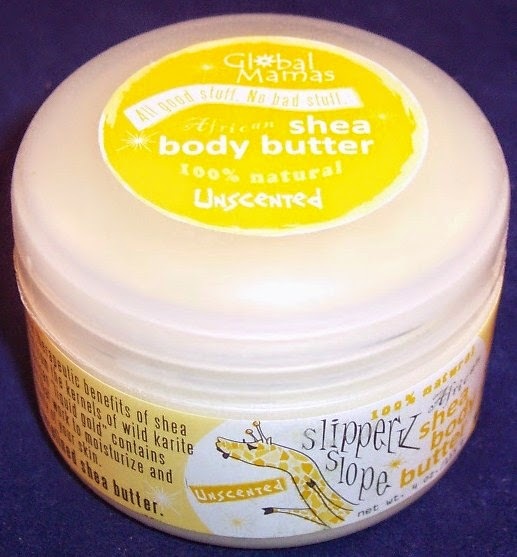 The next item is a container of Slippery Slope Shea Body Butter. Shea butter moisturizes and restores your skin and is considered "liquid gold" in Ghana. 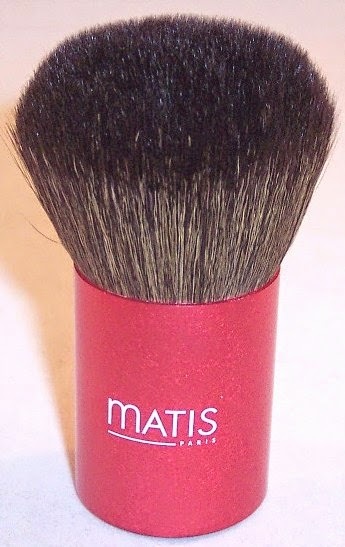 I like that this one is unscented so it can be layered with other scented products. 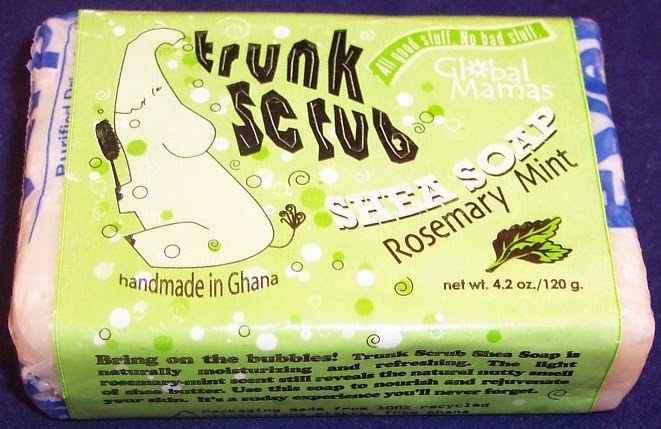 My favorite product in this box is the bar of Trunk Scrub Shea Soap in Rosemary Mint scent. It has a nice slightly herbal minty smell. 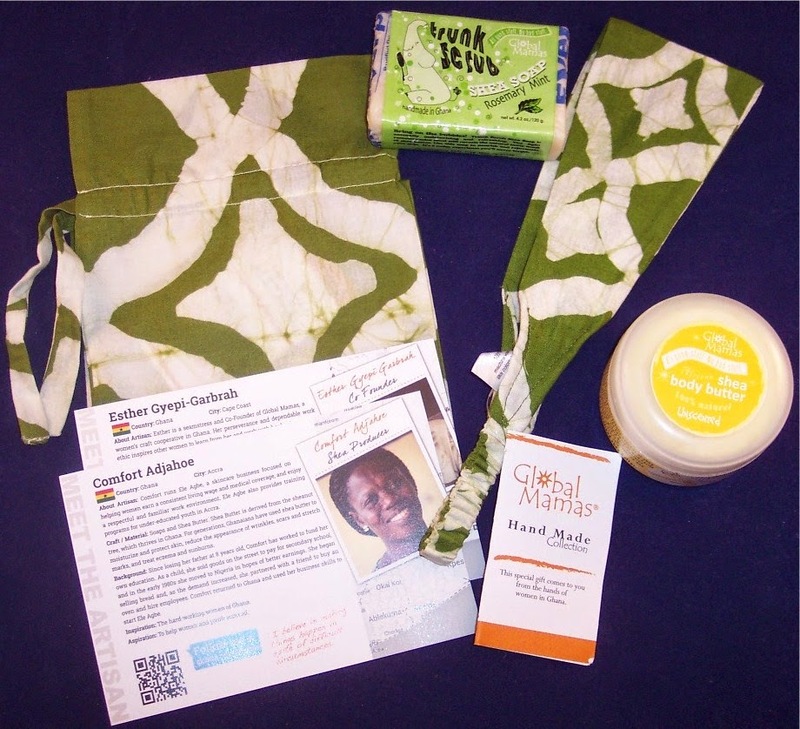 Both of the shea butter products are made by a business in Ghana called "Global Mamas". That's everything in my October Globein box. If you are interested in subscribing, use code FBFREE to get your first box for just $5.00. (Basically, the box is free...you're just paying for the shipping.) Oh, I forgot to mention...you can change the theme for your box as often as you'd like. That gives you an opportunity to try out all sorts of categories of products. I think I'll try their home category next. I love the concept behind this company and strongly encourage all of my readers to check out their website, whether or not you decide to subscribe to this box. It would be a great place to do some Christmas shopping or pick up some very unique items for your own home! Disclosure: This post contains no affiliate or referral links. Products were purchased with my own money and all opinions are my own. 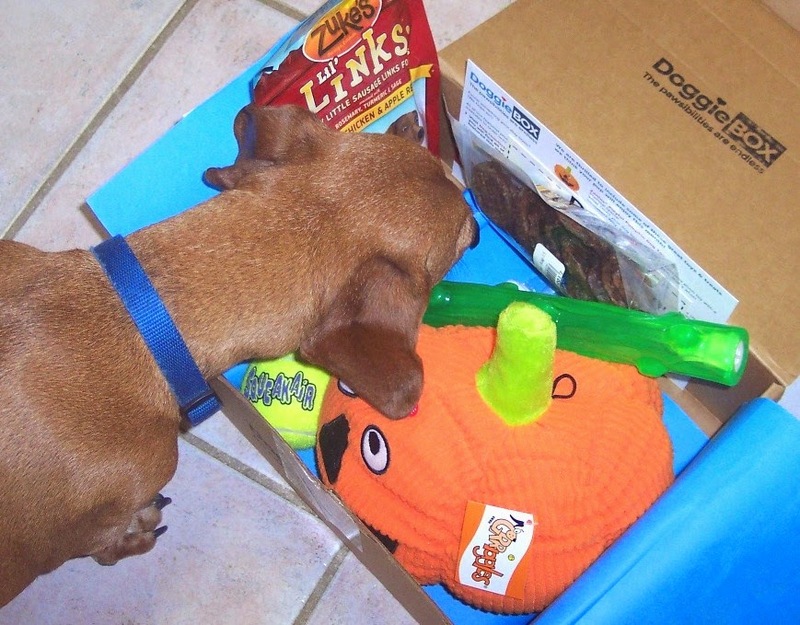 DoggieBox is a mystery toy and treat box for your pup put together by the folks at Dog.com. Boxes have a retail value of $41.46 and cost $24.99 plus free shipping. You can buy just one box for that price or set up a monthly subscription at the same price. 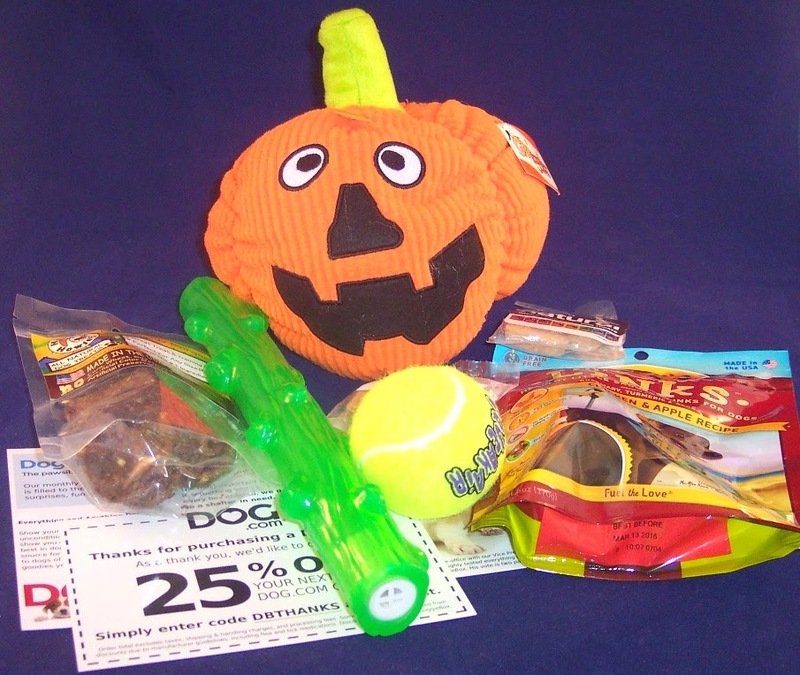 Items in the box are hand picked and includes all sorts of things that will "delight" your dog! Tucker, my Chief Product Tester, and I decided to order a single box because we receive several other dog subscription boxes. Quite frankly, he is exhausted from his responsibilities (which he takes very seriously) so I decided not to overwhelm him with another subscription. (See Tucker in his Halloween costume at the bottom of this post.) 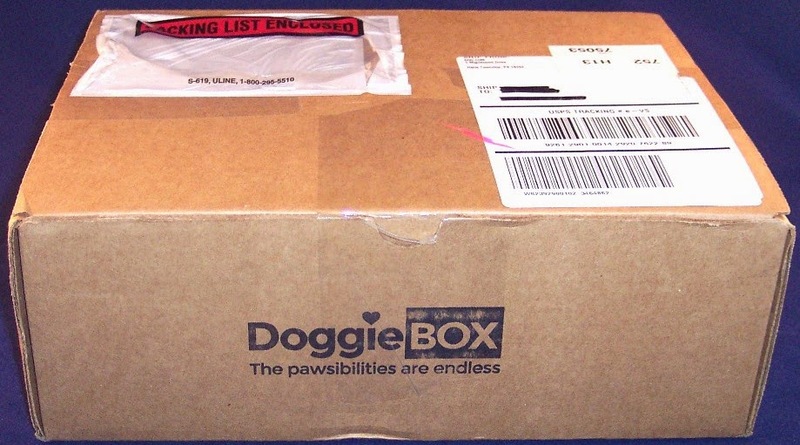 Our DoggieBox arrived in a large branded cardboard box. Inside everything was wrapped in pretty blue paper with a "Trevor" sticker...their in-house product tester. Tucker LOVES this part of his job....the initial sniff test! He was most interested in the contents of the box although two of the items are much too big for him. We both really liked the seasonal curation of this box which reminded me to get Tucker's Halloween costume out and ready to go trick or treating! 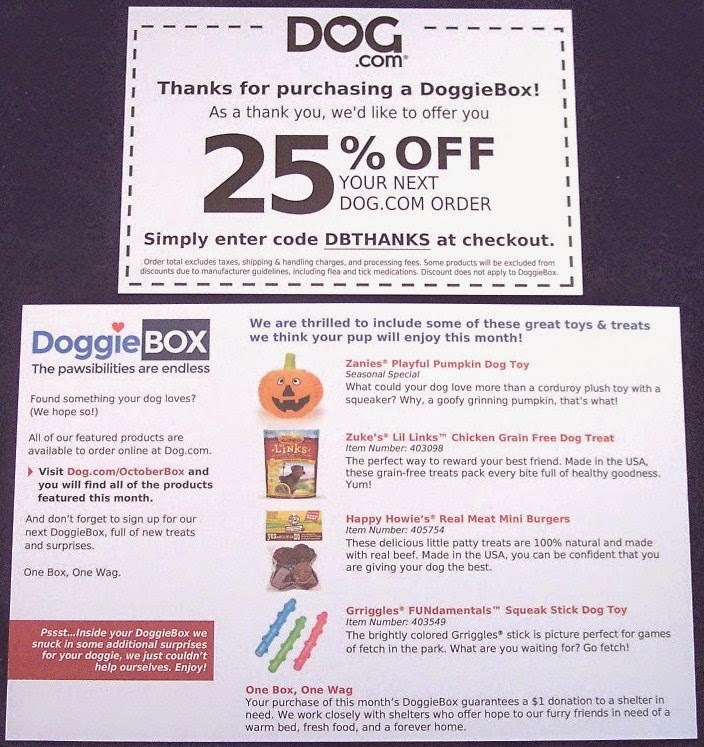 There are two cards in the box; one which identifies and tells about each item and one that provides a discount code for use on a Dog.com order. If you're interested in taking advantage of that, use code DBTHANKS at checkout. 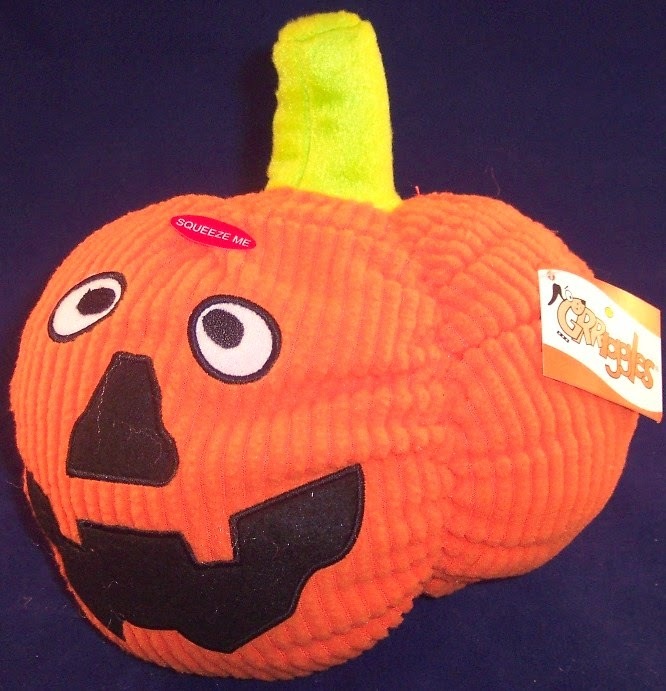 There's no ignoring the biggest and most obvious item in the box....a crazy eyed corduroy plush pumpkin squeaky toy. This is SUCH a cute item and so perfect for this month! Unfortunately, Tucker isn't really into squeaky toys and even if he were, this one is much too big for him. So our sweet Rhodesian Ridgeback neighbor dog Marley, who lives for squeaky toys, will be receiving this one! 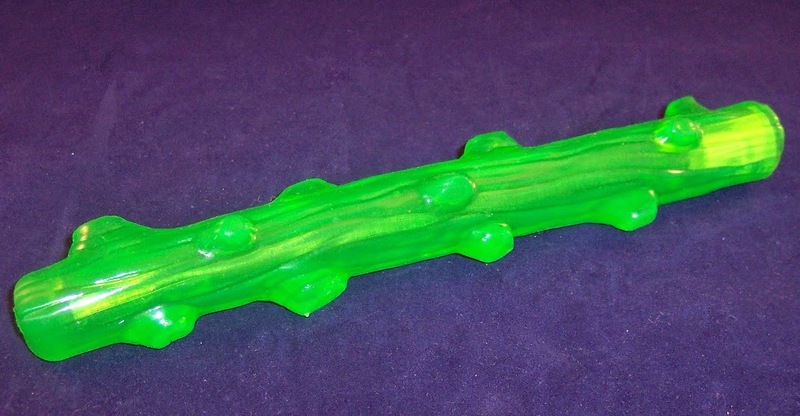 Next is another squeaky toy, a big neon green rubber stick that has a satisfyingly loud squeak when you squeeze it. At almost a foot long, again, this is just too big for Tucker...but it's a REALLY cute toy! 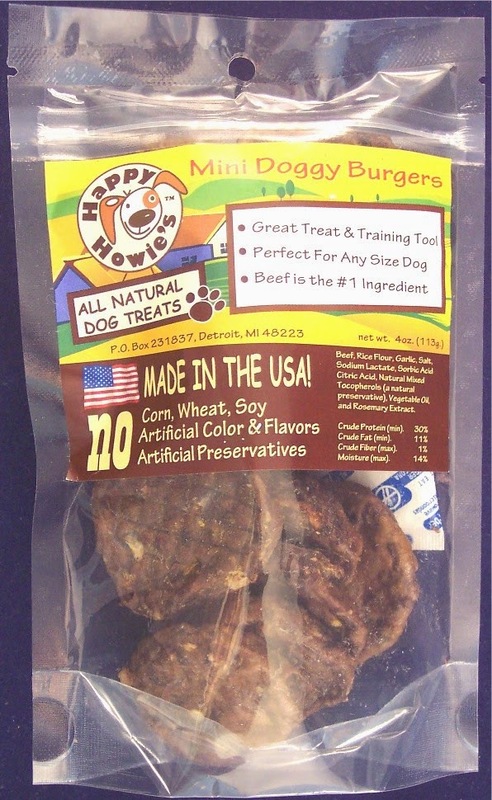 There is a package of Mini Doggy Burgers by Happy Howie's. These are 100% natural little patty treats made with real beef. These are very hard and chewy...right up Tucker's alley. He loves these! 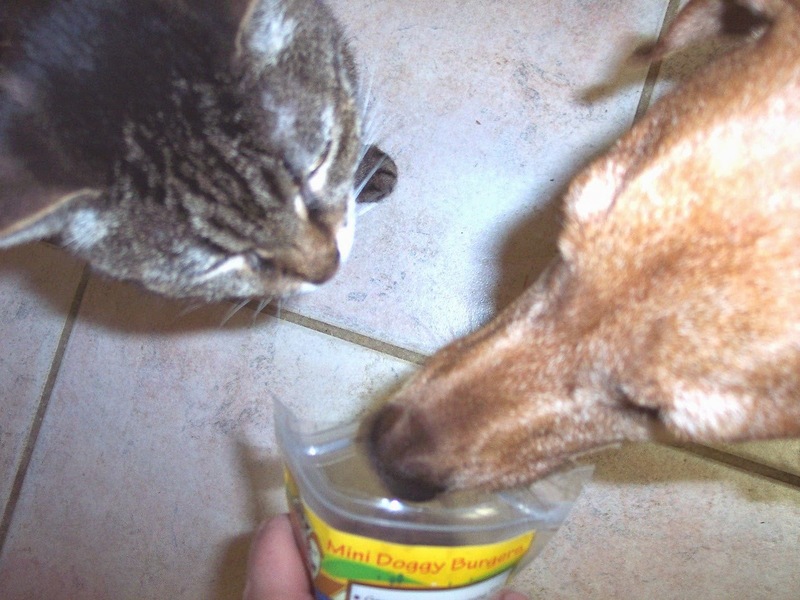 Guess who else was MOST interested in the Mini Doggy Burgers? There's no way her little mouth could handle them though. There is a lot of food sharing between these two, despite my best efforts. 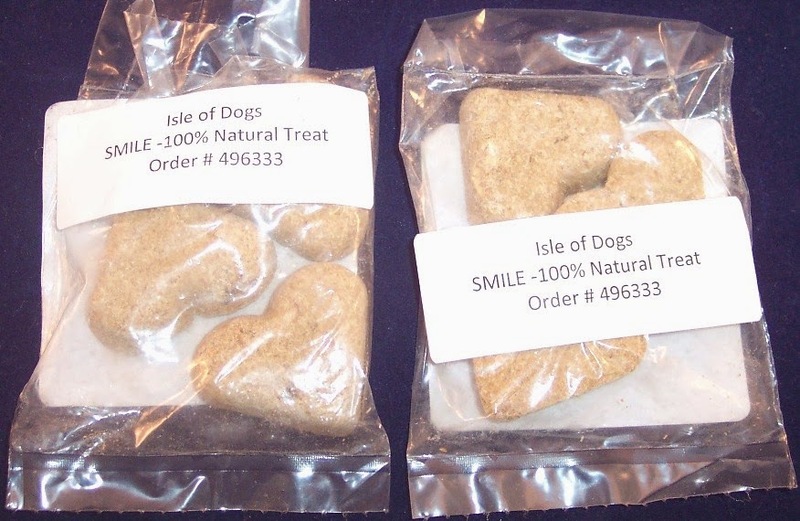 There are two small packages, each containing three heart-shaped natural treats from Isle of Dogs. Tucker loves anything that even remotely smells or looks like a treat so no problems with these. Tucker's two favorite activities in life are chewing and chasing. 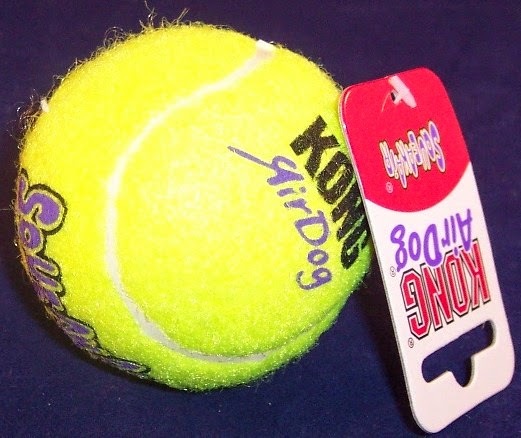 This yellow ball by Kong Air Dog will get a lot of use. I just have to keep it out of his reach when we aren't playing together because he loves to chew the fuzzy fabric off the ball. This one squeaks but it won't for long once Tucker gets it alone for a few minutes! The last item is a 6 oz. 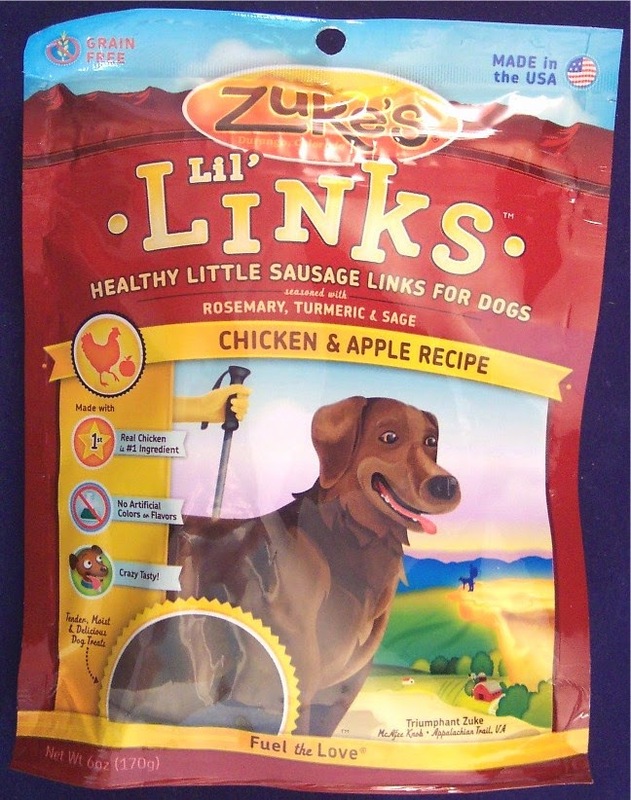 bag of Lil' Links, chicken and apple flavored sausage link treats. Tucker is literally sitting up on his bottom begging me for one of these as I type this....where is my camera when I need it??!!?? These are soft treats and his favorite item in the box. The only issue here is keeping them out of his reach so he doesn't eat the entire bag at once. These are definitely something I will re-purchase for him. 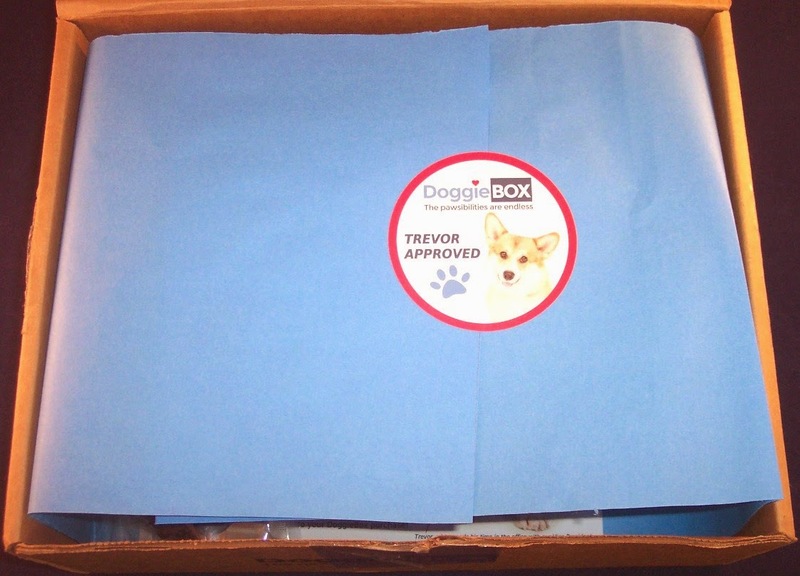 This box contained high quality products and all of the edible items were sourced in the U.S.A., a credential that is increasingly important to many pet owners. Also, they donate a dollar to a shelter in need for every box ordered. That feels good! The only issue for me is that they don't currently allow for any customization. You can set up a pet profile on the Dog.com site but for now, I don't think this information is being used to curate the DoggieBoxes. That means you may get items that do not fit your dog in one way or another. Keeping that in mind, this is a great box for households with multiple sized canine family members. DoggieBoxes ship around the 15th of each month so if you want the current month's box, you'll need to sign up by the 10th. If you've tried DoggieBox, please let us know what you thought in the Comments section below. P.S. Here's my little bumblebee modeling his Halloween costume. And yes, we most certainly DO go trick or treating! Disclosure - This post contains no affiliate or referral links. I paid for this box myself and all views and opinions are my own. 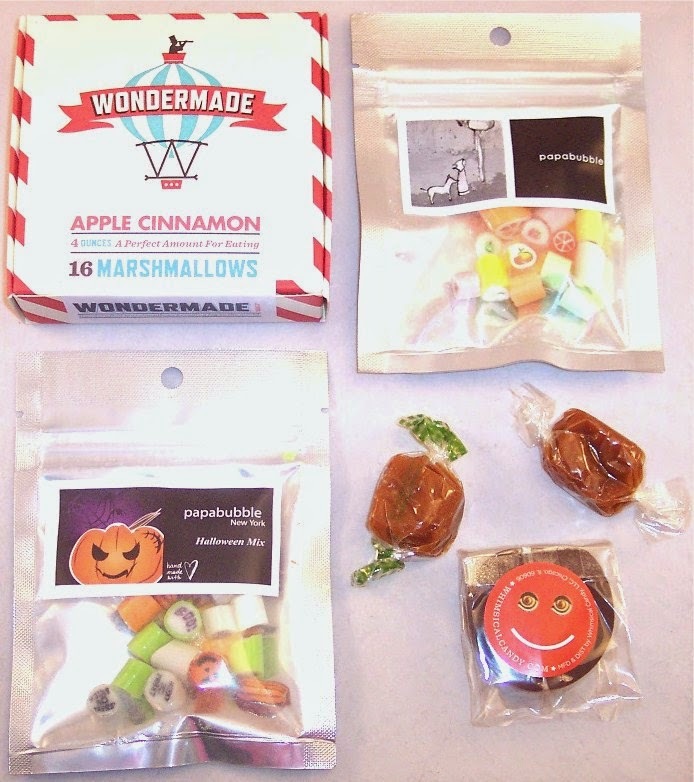 Treatsie Artisan Sweets Subscription Review, October 2014 + Double Sweets Code! For those with a serious sweet tooth, Treatsie may have just what you crave! Every month they send artisan treats from three different vendors. Each box has a retail value of $20 to $25 before shipping. As with most food subscriptions, the box value is not a lot higher than what you pay but you definitely get a diverse assortment of gourmet sweets that are probably not available to most people on a regular basis. You are billed according to the plan you choose and can cancel at any time. 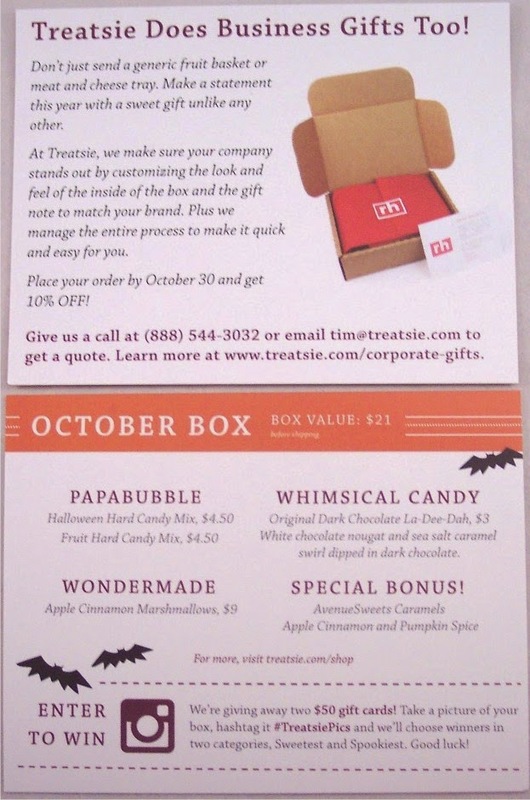 Treatsie usually ships around the 15th of the month but you can check the shipping calendar on their site to see exactly when the boxes are going out. The October orders are just now arriving so let's see what they sent! 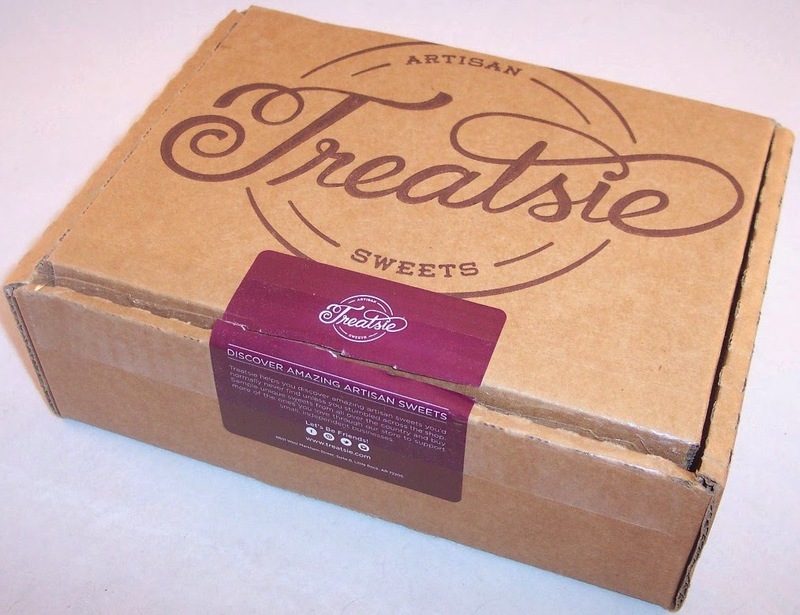 Treatsie is shipped via USPS first class mail and comes in a branded cardboard box. First things first. There were a couple of cards enclosed which I have somehow managed to lose just since taking the photos. (I'm talented like that.) One advertises their business gift service and the other tells about each of the vendors represented in this box. Skimpy or not, I really like everything Treatsie sent this month. 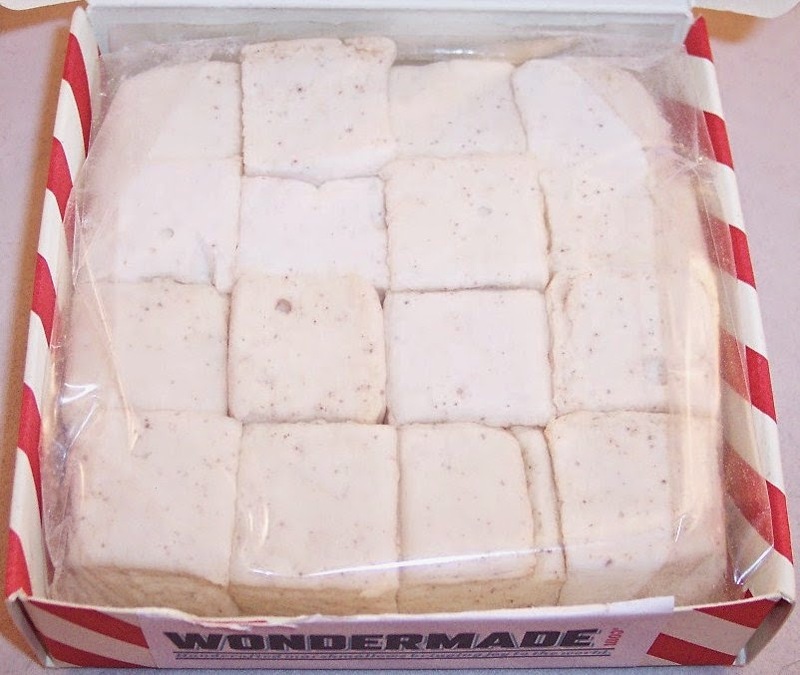 First is a cute little red and white striped box containing handcrafted marshmallows by Wondermade. 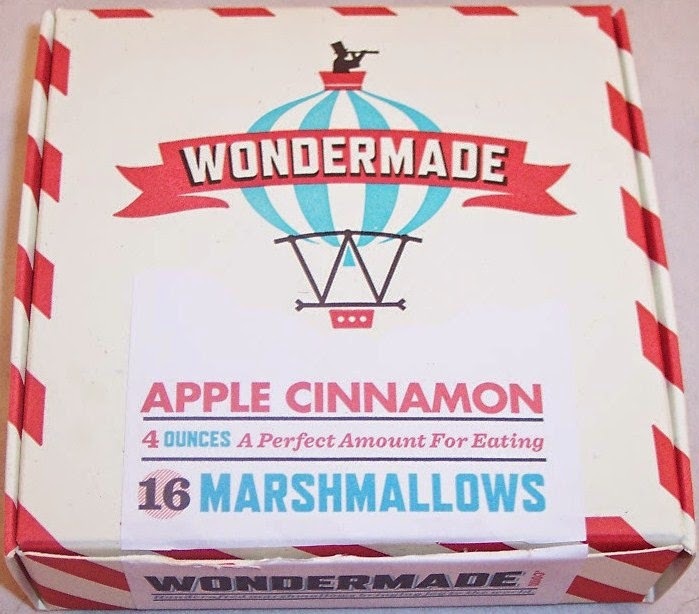 This box contains 16 one inch square marshmallows with a light apple cinnamon flavor. Very good! 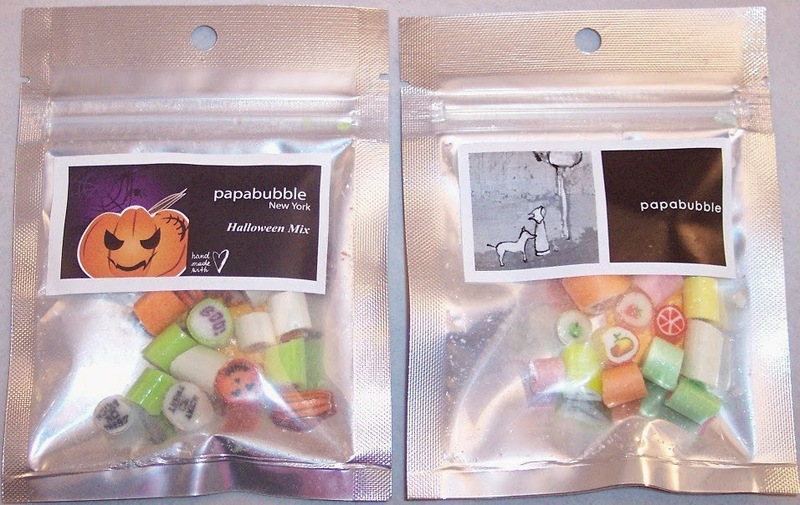 There is a colorful Halloween mix of hard sugar candies by Papabubble and the same thing in a non-Halloween version. These little candies have adorable little designs and sayings on them and each one is flavored differently, according to color. Treatsie has sent similar sugar candies from another vendor in the past that I didn't really care for but the flavorings in these make them go down very quickly. And they're just so darn cute! This next candy is completely new to me so I had to look up the description on Treatsie's site. This is called an Original Dark Chocolate La-Dee-Dah from Whimsical Candy. I'm describing this one from memory as it magically disappeared within seconds of opening the box. 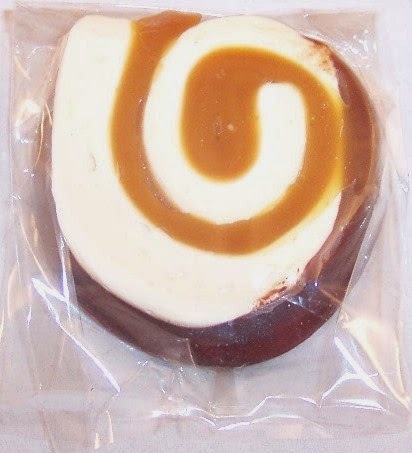 It's a small round candy about an inch and a half in diameter, made of white chocolate nougat swirled with creamy sea salt caramel, then dipped in dark chocolate. At $3 apiece on Treatsie's site ($2.25 on Whimsical Candy's site...yes, of course, I checked), these are ridiculously expensive. Even so, at least one or two should be on everyone's bucket list! 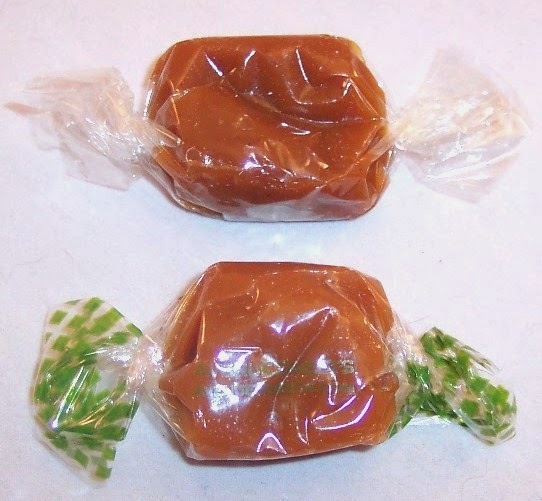 And finally, there are two individually wrapped caramels from AvenueSweets. One is apple cinnamon flavor and the other is pumpkin spice. I gobbled down the pumpkin spice caramel; it most definitely had a gourmet flavor and texture. A lot of food subscription boxes send high quality caramels; I've learned to really appreciate them! As I mentioned up top, Treatsie does a really careful job of packaging any of their products that are liable to melt. During the past two or three months (where temps reached 100+ degrees where I live), I was surprised that they sent quite a bit of chocolate. The packaging was nearly bomb-proof but even at that, the contents of one of my boxes was completely melted. All it took was one e-mail and I got an immediate friendly reply from Treatsie. They sent a replacement package right away. Since then, I've learned that they have a "Melt Free Guarantee" so if you receive anything that is not in good condition, they will replace it. It does seem to me that it would make more sense to hold off on sending chocolate until the colder months but hey....with a guarantee like that (and one that I've personally tested), I am not complaining! 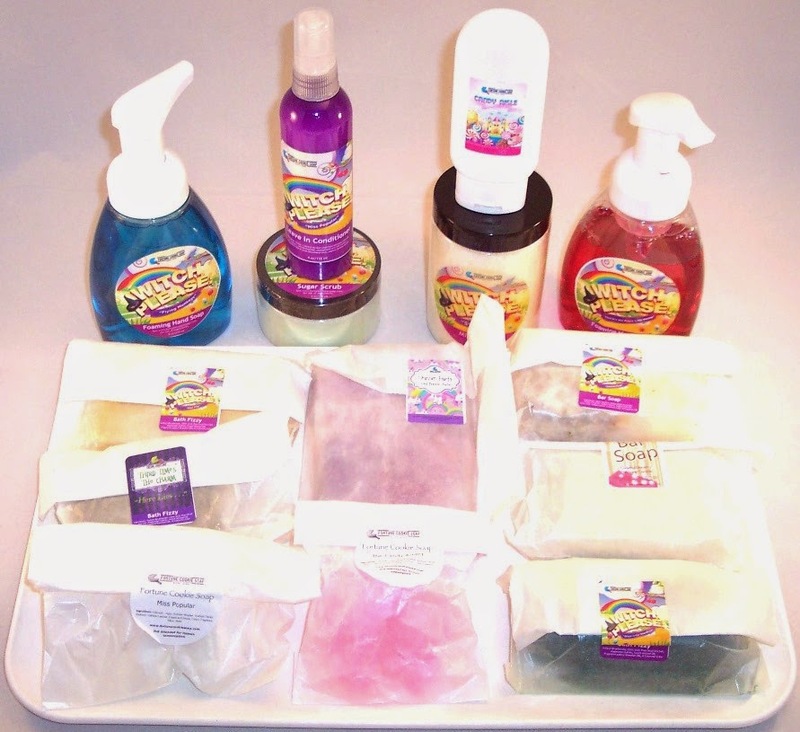 Treatsie sells many of the products in their boxes individually on their site. The prices are high but they have a good rewards program, where you get a point for every dollar you spend and that includes money spent on subscriptions. For every 100 points you accumulate, you get $10 in store credit. Treatsie has a great deal right now where you can get double the sweets when you sign up for a new subscription. (I believe that's just in the first box but I'm not positive.) If you want to take advantage of that offer, click here and use code FRBUC001. If you want to order a la carte from their site, use code FREESHIPPING on orders over $49. Let the sugar rush begin!